Does Tungsten Grind Angle make that much difference? This Video shows the difference in depth of penetration and bead profile using 3 different tungsten grind angles. The pictures below show very distinctly different arc cones from the 3 different electrode angles ground. top is 60 deg, middle is 30, bottom is 15. Arc starts are crisper with a very sharp tip...and there are times when a crisp sure arc start is more important than the penetration profile. One example I can think of is when you need to weld near a cooling fin. The arc seems to prefer to strike on edges of thin areas rather than the flat area of something thicker. For these type of applications, the 15 deg needle type point might be best. ...or when you need to weld something really thin like a razor blade and you dont have small diameter electrodes, a needle taper along with a polish really helps. 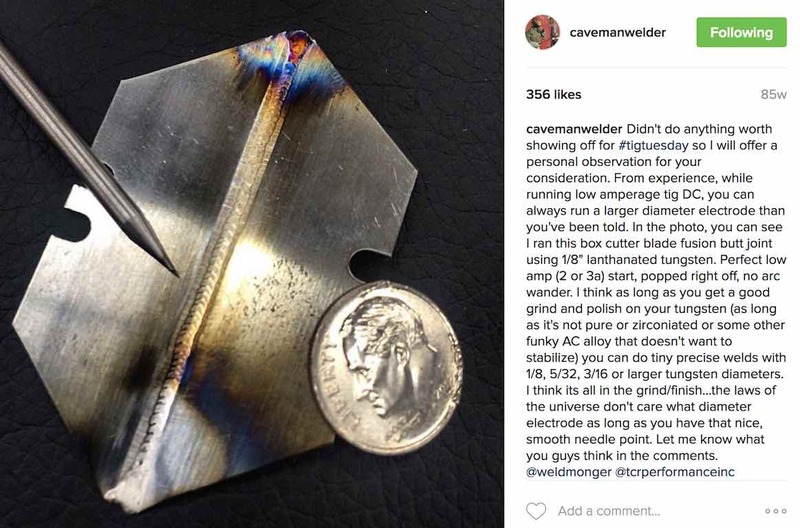 My friend Alex Brown (also known on instagram as @cavemanwelder) shows an image of a box cutter blade he welded using a 1/8" (3.2mm) electrode sharpened like a needle and polished. His post states his opinion that you can use a larger electrode than you have been told as long as you get a good grind and polish. I definitely agree within limits. Even though I usually go with a 3/32" (2.4mm) 2% lanthanated electrode for most of my welding, there have been times when I just used a 1/8" (3.2mm) for everything. I just did what Alex did for thin stuff. But for higher amperage welds on thicker metal, the more blunt tapers reduce the risk of tungsten inclusions. I worked on a particular nuclear plant where supervision decided they were seeing too many tungsten inclusions on pipe weld x rays. So they tried to get everyone to adopt the 60 degree angle blunt taper. they even handed out full packs of pre sharpened electrodes with the blunt taper angle. Every single welder I knew, re ground those electrodes to be more like a 30 degree angle you saw me use second in the video. Just goes to show you that welders ...more often than not, use what they are most comfortable with when it comes to machine settings, electrode angles, electrode type, cup size, etc. The difference in the penetration profile was very subtle between the 60 deg and the 30 deg taper but I would say the risk of getting a tungsten inclusion would be less with the 60 deg tungsten grind angle.